This latest installment in Nalini Singh’s Psy-Changeling series features a strong but broken hero and a heroine with a bottomless heart. Vasic is the most capable, deadliest, and guilt-ridden member of the Psy Arrow squad. The Arrows were the covert ops arm of the Psy Council for decades. Charged with maintaining the emotion-suppressing code of Silence, the Arrows often had to kill those who violated it or mop up after the sociopaths who so easily hid within that emotionless philosophy. Although Arrow squad members were trained from childhood, often abusively, to the emotionless ideal of Silence, many of them found that the work ate away at them. Because Silence was always a flawed system, it became unsustainable. The beginning of the end of Silence was explored in the first novel of this series, Slave to Sensation. Now an infection is eating away at the PsyNet, the mental network all Psy need to maintain brain activity. In an effort to save the network, Kaleb Krychek, a powerful telepath/telekinetic has devised a plan to use empaths, who were despised under Silence because they were so emotional, to counter the insanity and violence the infection causes. Krychek sends Vasic, a telepath and teleporter without peer, to fetch Ivy Jane, one of those empaths. Ivy and Vasic are drawn together from the moment they meet. Her empathic gifts allow her to sense the man behind the icy façade he maintains, and her natural warmth draws Vasic like a moth to a flame. While he insists there can be nothing between them, he longs for the affection, and then the love, she offers. All is not rosy, however. Ridden by self-loathing for the things he did under Silence, Vasic volunteered to test a prototype high-tech gauntlet that’s grafted into his nerve system. Now the gauntlet is failing, and the brilliant scientist who designed it is unavailable because of a mental breakdown. If Ivy and Vasic cannot find a way to repair or remove it, anything between them will have only a short time to flourish. So Vasic resists completely bonding to Ivy. As though that weren’t enough, the deterioration of the PsyNet causes episodes of mass violence by affect Psy, and these incidents are increasing in frequency, with ever more casualties per occurrence. 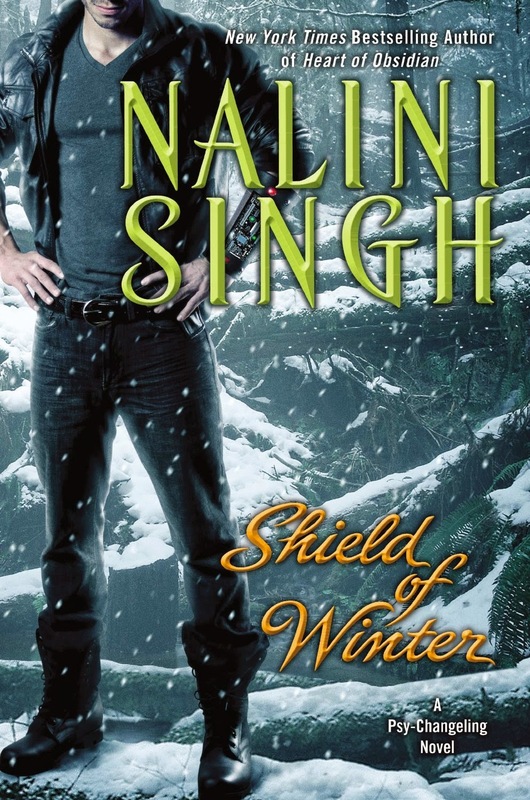 Singh ably uses characters from earlier books, and the theme of adapting to change progresses in Shield of Winter as it does in each installment before it. Readers who have not read the earlier volumes, though, should be able to start with this one. Not realizing the books had an overarching plot (as well as a complete romance in each book), I first picked up the third book, Caressed by Ice, which is about a former Arrow who fled Silence to protect his family and found asylum with the SnowDancer changeling wolf pack. I had no difficulty following the story and went back to devour the first two books before blitzing through the remainder. Readers who prefer more deeply seated, personal obstacles as relationship conflicts may not like this book as much as some others. For me, if something believable sustains the conflict, I’m happy. The only reason this book doesn’t get 5 stars is because there are others in the series that grabbed me just a wee bit more. I've not read this series but it's always nice to know that you don't have to read them in order. There's more of a chance that I would then give this a try! Catslady, I didn't have any trouble figuring out what was going on. I like this series a lot. I read a novella Singh wrote for an anthology. I was intrigued by the Psy-Changeling world, but haven't had a chance to explore any further. That anthology was my introduction to the paranormal sub-genre and 6 authors I would like to read. Nalini Singh's series sounds like a good place to start. Thank you for the review of SHIELD OF WINTER. Librarypat, I'm glad the review was helpful. I hope you enjoy the series!